Life is full of surprises, isn’t it? There’s always something going on, and it’s never quite like we predicted – good, bad, or otherwise. And I’ve really felt these past two years have been a roller coaster for me. From divorce, to finding new love and new adventures, to finding myself and what I want in life – it’s been chaotic and filled with new. And all of this has taught me one thing: God has plans far beyond my wildest dreams or expectations. Just when I think I’m at my lowest low, things look up or start to improve, and I find myself in a place I never dreamt I’d be. For example, I never thought in a million years that I’d be divorced (yes, I’ve said this a million times #sorrynotsorry #truth). But here I am, thankful for the divorce! Say what?! It’s true. I’m thankful it happened and for where I am today. Just when I think I’m settled and am in a good place, God moves me and change happens. Change that I’m resistant to and struggle with, but that happens regardless. And because of it all, I know more about myself and my God than I ever imagined. But I want more. This goes for so many things in life, and this year, I’m joining in the fun that is One Little Word, and I’m focusing on the beyond. I want to break down the barriers that come with expectations and limitations. I want to free myself from what other people think and feel I should be doing or who I should be. I want to open myself and my life to every single possibility that’s out there – anything and everything that God has in store for me. I want to be accepting of it and of all the lessons and strength and passion and happiness and frustration that comes along with it. This year, I’m focusing on the beyond. I’m opening myself and my thoughts and actions up to everything outside my own understanding, breaking my own limits that I set upon myself time and time again. Beyond the negativity. Beyond the hurt. Beyond the pain. Beyond frustration. Guilt. Anxiety. Sadness. Ridicule. Criticism. Grief. But also beyond my own realm of happiness. Beyond my knowledge of the Word of God and what I think I already know of Bible Study. I’m going to push past the limits of exhaustion and restlessness and most of all, procrastination. I’m going beyond it all. I’m striving to go beyond what I believe in myself – to reach new heights within my self discovery and really find out who I am and what I’m capable of doing/being. I want to surprise everyone, but mostly myself. I’m aiming to reach beyond the impossible; beyond the improbable; beyond the unlikely. And I’m hoping you’ll join me. Or at least follow along. Because part of this “beyond-ness” is documenting what it looks like and what’s coming of it as this year happens. That’s right, I’m going BEYOND my initial hopes and dreams for this blog, too. Which means more content, more consistency (thank God! ), and more fun things to look out for. And that’s only in one area of my life. I’m excited to see what all this year holds! In 2016, I’m living BEYOND. I’m so excited for a new month and the turning of a page. So many people are currently freaking out that it’s already November and that they have so much to do in the next two months for the holidays. But me? I’m so thankful to welcome November and all it holds! I say, bring it on. And with a new month, I have new goals that I want to accomplish this month. But first, a recap of October. 1. Participate in two blog linkups. Check! I linked up with Amber for her monthly letter linkup where I wrote a letter to God about my safe places. I also linked up with Shay for What’s Up Wednesday, where I shared what all is going on in life right now. 2. Carve a pumpkin. Check! I carved it – the pumpkin we picked up a few weeks ago while celebrating my birthday – on Halloween while Cory gave advice and helped me out. It had been probably at least 10 years since I last carved a pumpkin, and I learned that I have NO IDEA why I waited so long to do it again! It was fun :). 3. Finish the Book of John study. Fail. Again. Is this real life? Can one seriously fail at something so important over and over again? It turns out that the answer to that is a big, fat YES! Ugh. I hate myself. 4. Celebrate my birthday. Check! I spent the weekend with my absolute favorite people doing fun, fun things! Check out the recap post here. 5. Bullet journal the entire month. Check! I did keep up with this all October long and am oh so proud that I did! I felt on top of things and really enjoyed digging into the bullet journal all month long. Looking forward to continuing this! 6. Read two books. Check-ish. I read one and a half, so that doesn’t really count as a check, but it’s not a complete fail either. Either way, I’ll take it! Book of John Bible Study. I’m going to keep this one as a monthly goal until it’s completed. I’m so upset with myself that I keep letting it slide, so I’m on a mission to really take care of this one in November! With Thanksgiving being this month, my goal is to really focus on giving thanks all month long, for anything and everything! I’m going to really try to stay positive and keep my perspective in that of thanksgiving. I’m keeping it simple this month and really striving to go three for three! I don’t want to set myself up for failure this month and knowing there’s a major holiday in there can really throw things off, so I’m keeping it light and am looking forward to some successes. As I’ve been excitedly proclaiming for the last 5 days now, IT’S OCTOBER! It’s one of my favorite months and with that come some of my favorite goals. Let’s get to it. But first, as always, a recap of September. 1. Practice patience. Yes! This one definitely happened in September – there was no way for it NOT to have occurred! It was another kind of emotional month just with where my life is and what my future may or may not look like (vague, I know. #sorrynotsorry). But things are getting better and I’ve spent much more time in prayer this last month, including praying for patience. I really feel that I’m mayyyyybe getting somewhere with this. It’s definitely not mastered, but I’ve absolutely been practicing! 2. Book of John study. I feel really awful that yet again, this didn’t happen like I intended for it to. However, even though I didn’t finish this study as it was started, I have been spending more time in the Word and even kind of, sort of started a Bible study with some girls at the office! So, even though this goal wasn’t met, I’m pretty proud of the reasons why it didn’t. It still very much involves the Lord and spending quality time in Scripture! Okay, now let’s take a look at October! Participate in two blog linkups. I love a good linkup, as all bloggers do, and really want to participate in TWO this month! I have my eye on a few that will be occurring and can’t wait to get to writing. I honestly can’t remember the last time I carved a pumpkin. Seriously. It’s been years! I’m hoping (and planning) to rectify that this month! Finish the Book of John study. Okay, third time’s the charm, right?! I’m digging in my heels and am going to do whatever it takes to complete the book of John study this month. Ready, go! It’s my birthday month!! Which means I want to do all the celebrating. Well, not all of it. I don’t usually make a big deal out of my birthday and in years past have been known to just treat it like another day. However, for some reason, I’m seeing things differently this year. My birthday seems different this year, so I’m hoping it IS different! I’m just ready to celebrate, in some way, shape, or form. C-E-L-E-B-R-A-T-E (maybe with a thing of two off my wish list?)! Bullet journal the entire month. I’ve been trying my hand at this whole bullet journal thing and felt that I limited myself too much in the months past, which is why I haven’t just been in love with it or very successful. However, I really want to stick with it through the entire month of October and just see how it goes, with no restrictions and no limits. I’m kind of excited to see the end result! I’ve gotten off the reading wagon recently and am ready to jump back on! But I want to be realistic at the same time, so I’m aiming for two books this month instead of my usual, lofty goal of three. What are your goals this month? No matter how big or small, I want to hear about it! 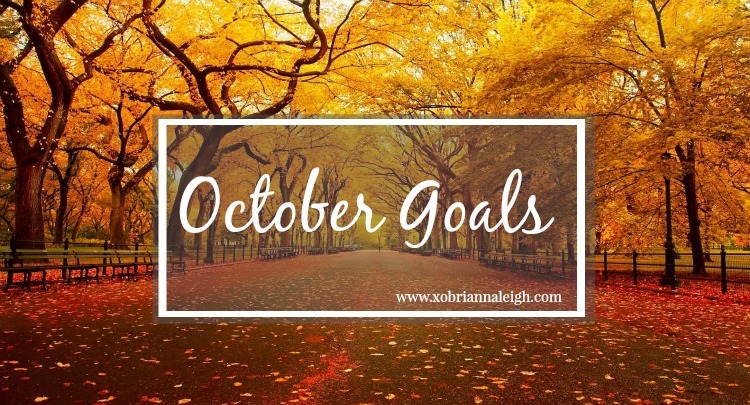 Leave a comment or link to your own post about your October goals. August was hard. Like, really hard. Nothing drastic or tragic happened last month, but it was a super long, stressful, frustrating, confusing month that really took a toll on me. I had to spend a lot of time looking deep within myself and in prayer to figure out what’s next and answer some pretty tough questions that came up last month. Overall, I’m left exhausted and in a rut. It’s okay, but it meant for a not-so-gratifying end for my August goals. Let’s recap. Fail. I only read one, but you can check out my review from yesterday, here. Yes, yes, yes. Although they’re not quite where I’d like them to be, I’ve gotten better about portion control and am learning not to beat myself up too much when I decide to indulge (like Sunday’s lunch of delicious sauerkraut). 3. Book of John study. Sadly, this one was a fail. An epic one. However, I’m not upset about it at all. If I can’t give it the focus and attention that it deserves, then I’m glad I didn’t go at it only halfway. It’ll be on my list this month, too, so I’m hoping for some patience and focus to dive right in! Yes! I picked up and cleaned up clutter, so now I have an organized mess – although, organized chaos is more like it! As for September, I’m keeping it simple. I didn’t get this done last month in any form or fashion, so it’s definitely a big goal of mine to accomplish this month. I’m praying for the clarity, peace, and focus to sit down with this study and really get into the Word. And not only read it, but fully comprehend, understand, and put into practice what I learn and am drawn to while studying John. That’s it. That’s what I hope to accomplish this month. It’s not a long list, contains nothing super fancy or dreadful, and it’s completely attainable. I don’t want to set myself up for failure this month. I want to be able to accomplish these goals no matter what life throws my way this month! And I don’t want to feel overwhelmed. Making too many goals per month while I’m on the road so much puts a lot of pressure on myself and I’m not satisfied with that type of life. So, I’m changing it up and am striving for patience and completing the Book of John Bible study. Let’s do this, September!